Grab some mates or go solo and prepare to have some good old fun getting amongst nature while also soaking up some gorgeous views of Te Anau! Located just 5km from the Te Anau township is our beautiful private farmland – your playground for 90 minutes. Start with a full safety briefing and instruction on riding the quad then gear up with your courtesy safety helmet, gloves, goggles, overalls and boots and it’s time to explore. Breathe in the fresh country air as you drive through natural terrain and enjoy uninterrupted views of Te Anau township, mountain ranges and a wildlife reserve! You don’t need to worry if you have no experience – our guides are specialised in catering for all different levels within the group, from beginners to experienced. All you need is the desire to have fun – which our quad bike adventure can guarantee! Free transfer service is included from your accommodation in Te Anau (please request at time of booking). Even in cloudy weather this tour is worth it. Andy was knowledgeable of the area and we learned so much. He even told us about things to do and see in Invercargill based on our interests. Andy tailored the Quad adventure to our skills and checked in to make sure everyone was comfortable and having a good time, which we did! Would highly recommended this activity. It was an amazing experience! Thank you making us feel so comfortable and helping us to have the best experience possible. And thank you for the lovely photos! Would definitely recommend! 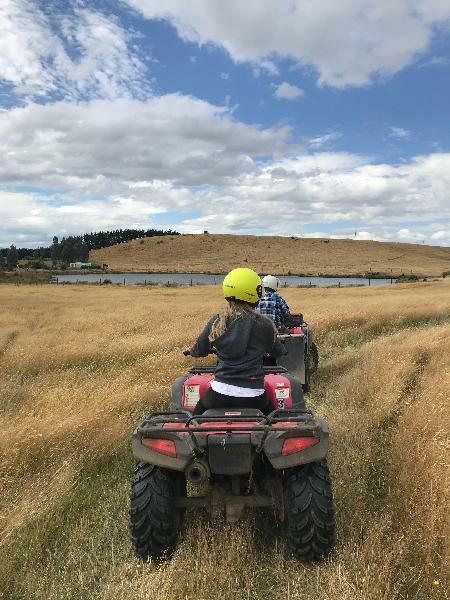 During our time in New Zealand we have taken a variety of excursions, seen a number of attractions and experienced new and exciting adventures,the Quad biking was our number one. We had not been on Quad bikes for over 10 years. Kevin our guide and Josh were outstanding, with very good briefings and practice before you start the trip.Thanks again, I would recommend this to one and all. My son and I had a great ride through the countryside with Andy....thanks for the sandfly spray tip mate ! Andy is able to assess and cater for a range of abilities for quad biking, and my Husband and I were lucky to have the trip to ourselves and even had a chance to help herd the horses. Great fun challenging yourself at speed. Loved it!! Your message has been sent to 90 Minute Quad Bike Adventure. You should hear from them shortly. Please note: all responses will come directly from 90 Minute Quad Bike Adventure, and not the team at Bookme.